The airport is 9 miles north of Calcutta and it takes at least 40 minutes to get into the city. This is also the departure point for flights to the Andaman and Nicobar Islands. Calcutta is well connected to cities throughout India by means of an extensive rail network. The Metro is an efficient way to get around the city or for the authentic experience, raise a hand and stop a bus! Calcutta is regarded as one of the world’s great cities. It grew from the amalgamation of three small villages on the banks of the Hooghly to become the capital of British India in 1857, and maintaining its status until 1911. It retains a strong colonial feel through many of its buildings.The city grew as a flourishing commercial centre with impressive Victorian buildings and churches. It also had a vibrant intellectual and cultural tradition combined with a divergence of political views which led to the growth of the nationalist reform movement. Revolutionary ideals within the city encouraged the British to move the capital to Delhi in 1911. It is interesting that a city which played such a great part in the rise of the British Empire should become such a major catalyst in its fall. Today West Bengal is one of only two Indian states with a Marxist-led government, Kerala is the other. The city buzzes with activity, but struggles with its image of poverty and overcrowding. Whilst there is no denying that life in the city is a” snug fit”( to quote a friend from Calcutta), Calcutta is a city full of character, and characters. It has a huge number of interesting buildings and sites to keep the visitor occupied for many days. Magnificent temples and mosques, faded mansions hinting at former colonial glory and historical buildings like the Indian Museum, all offer glimpses of the past. But perhaps it is the Bengalis themselves, and their culture, which is most intriguing. Calcutta is locally regarded as the intellectual and cultural capital of India and has produced many poets, writers, scientists, musicians, scholars and philosophers. Bengali dance, music, art and indeed film are world- renowned and there are many venues within the city to showcase the talents. One of the best ways to see the city is on foot. Walking tours offer a fascinating and informative glimpse of the city and gives the visitor a chance to get a really good feel for the city.Getting the timing right is essential in Calcutta, both in terms of time and season. Best time to visit is October to March. In the weeks leading up to, and during, the monsoon the weather is hot, sticky and seriously wet and uncomfortable- and is best avoided excepting by the brave-hearted. During peak season it is best to visit sites early in the morning to avoid the worst of the crowds. When it all gets too tiring, head for a restaurant for a Bengali thali ( a platter of dishes), aampora shorbat (soft drink made from mangoes with hint of lime) and of course, no meal is complete without mishti or sweets. In the heart of the city lies the square which is still referred to by its former name, Dalhousie Square. It is surrounded by British-era colonial buildings from 200 years ago. Ironically the square is now named after the Indian freedom fighters Binay, Bidal and Dinesh who tried to assassinate Lord Dalhousie, the Viceroy in 1930. They stormed Writers’ Buildings and killed the Inspector General of Prisons before being killed themselves. The gardens are located 4 miles from city on the west bank of Ganges. There is a 300 year old banyan tree in the gardens, said to be the largest of its kind in the world. This 19th century complex of 13 temples attracts worshippers of Kali, Shiva, Radha and Krishna. The symbol of Calcutta, this huge cantilever structure spans the Hooghly River supported by two 270ft high piers. India’s oldest and largest museum it has a wide collection of artefacts including sculptures from all over India, paintings and fossils. As with most museums all over India, it is closed on Mondays. Calcutta’s holiest Hindu temple, the current building dates from 1809. The Maidan is a huge area of open parkland used by locals for cricket, jogging or picnics. After the “Black Hole” incident the British rebuilt a second Fort William in 1758 and flattened the village in front so that the canons at the fort had a clear line of vision. This cleared land gave rise to the Maidan, Calcutta’s answer to New York’s Central Park. This extraordinary, rather dilapidated mansion built in 1853 houses fine paintings and chandeliers, floors with marble inlay and hundreds of statues and urns. It is free to visit but a pass must be obtained in advance from the West Bengal Tourist office and a tip to the staff is expected. It is closed Mondays and Thursdays. The name Mother Theresa is synonymous with Calcutta . Known simply as “Mother” to the people of her adopted city she is buried on the ground floor of Mother House, the headquarters of her order, The Missionaries of Charity. Situated within Rabindra Bharati University is Rabindranath Tagore’s family home which has been turned into a museum to one of India’s greatest modern poets. This imposing white marble edifice took fifteen years to build. The museum has relics from the British Empire and there is an art gallery. Photography is prohibited inside. At 7.15pm there is a light and sound show, not on Mondays. The Mallik Ghat flower market lies beneath the eastern end of the Howrah Bridge and is a great place for taking photographs, although not from the bridge as it is strictly prohibited. The Hooghly is a tributary of the Ganges and a sail along it is a nice way to escape the crowds and see the sites from a different perspective. Cruises vary depending on the amount of time you have available. A sunset cruise takes you upstream to Belur Math and Dakshineswar, while an all day cruise adds a visit to the Botanical Gardens. Overnight cruises or longer ones will take you to the Danish colony of Serampore and Barrackpore, former headquarters of the British Army, where the 1857 revolt broke out. 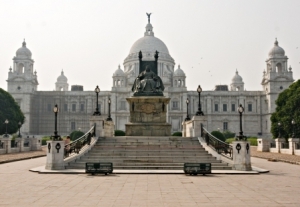 It is now home to many of the British statues removed from central Calcutta. The leisurely week long cruise upstream offer fascinating insights into rural West Bengal.